I have mentioned before that in your Disney resort, the concierge is the place to go for answering questions, help with dining reservations, theme park tickets, just about most questions that you can have. But what happens if you are at the parks and you have questions – head over to Guest Relations. Every park has a Guest Relations office; they are usually located in the front of the park. In the Magic Kingdom they are right after you pass under the train station on the left hand side, in City Hall. In the Animal Kingdom, they are as soon as you pass through the turnstiles on your left hand side. In Epcot they are on the left hand side of Spaceship Earth. And in Hollywood Studios they are right after the turnstiles on your left hand side. The helpful Cast Members at Guest Relations can help you with many different Disney dilemmas that may arise while you are at the parks! 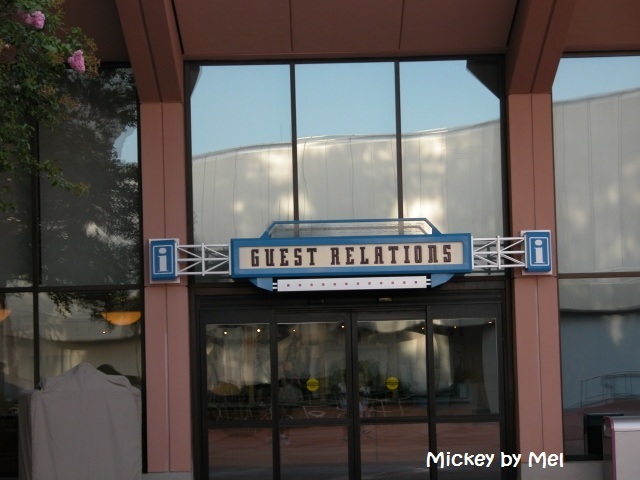 Guest Relations can help you with many different issues that you might have while you are in the parks. They can assist you with making same day dining reservations. They can also look up your confirmation numbers and dining times in case you forget. This is the place you can go to report anything less than magical that you might encounter while you are at a Disney park. And this is also the place that you will need to find if you lose an item in the park and it is the same day. (If it has been more than one day, you will need to contact Lost and Found for all of Disney – don’t worry the people at Guest Relations can tell you how to get there!) If you are traveling with a special needs visitor, you will need to make a special stop at Guest Relations to obtain a Guest Assistance Card that will help you while navigating the parks. I have used Guest Relations to locate a lost camera, find out reservation times, make a reservation, report less than magical bathroom status, locate a Mickey balloon after my daughter’s got blown away, get celebration buttons, and my kids have even gone in to ask for “Mickey glitter” (aka – Mickey head confetti). And every time we have had to go visit Guest Relations, we were greeted with warmth, compassion, and a solution. It might not seem like a lot but one story sticks out to me for how Guest Relations really goes above and beyond. My daughter had asked a Cast Member at Guest Relations for some Mickey glitter and gems. (She had received a pouch of it out of the blue on a previous visit and it stuck with her as a piece of Mickey magic.) I had already explained that they might not have any or they simply might not be giving it out anymore. The Cast Member checked and came back to tell my daughter that they didn’t have the gems anymore but she did have a big bag of Mickey glitter for her. My daughter said thank you, she truly was happy with the giant bag of glitter. The Cast Member also asked her who she was at Disney with – she told her: “me, my mom, my dad, and my brother”. So the Cast Member handed her a coupon for Mickey ice cream bars for all of us because she felt so bad that they no longer had any of the plastic gems. It absolutely wasn’t necessary but for a then 6 year old little girl. She couldn’t stop glowing and talking about how Mickey gave her and her family ice cream. That is what Guest Relations is all about – making sure that you know Mickey cares about your family’s vacation. You will have a fantastic time. When you go into Guest Services – be honest and open about what you need and what would help to make your vacation better. The problem I hear from a lot of people is that they didn’t want to ask or they were scared or embarrassed. Disney is all about being accommodating, so definitely don’t worry about it. And as for the Guest Assistance Card, you only have to get it once and it is good for the duration of your stay. Remember to take your time, relax and rest when you need to, and best of all – just enjoy! Wishing you a wonderful trip!